For this analysis, we pooled the 1996, 2001, and 2004 panels of the SIPP, a nationally representative sample of the non-institutionalized civilian population who are 15 years old and older. SIPP respondents are interviewed once every four months for the duration of the survey panel. During each interview, they provide information about the preceding four months. Each interview constitutes a wave; linking a series of waves creates a panel of 2-4 years. SIPP contains information on demographic characteristics, employment outcomes, and program participation of each respondent. A respondent's disability status can be identified in two ways. 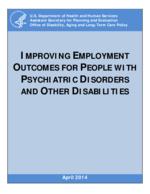 First, each SIPP wave asks respondents if they have a work limitation, which constitutes a work disability. Second, a topical module, asked at varying time points, asks respondents a series of questions regarding their disability and limitation status. We used the first approach to identify members with disabilities of various at-risk groups. We linked SIPP data to SSA administrative files to identify SSDI application dates, SSDI receipt, and SSI receipt. Not all SIPP records could be matched to SSA administrative data, either because SIPP respondents did not provide Social Security Numbers (SSN), respondents opted out of having their data matched to federal records (beginning in 2004), or the information from the SIPP (SSN, name, gender, date of birth) did not match SSA administrative data (McNabb et al. 2009). The match rate for the panels is 84 percent for the 1996 panel, 60 percent for the 2001 panel, and 79 percent for the 2004 panel. The statistics presented here, therefore, represent lower-bound estimates and could potentially be biased if non-matched respondents systematically differ by SSDI receipt or application status from matched respondents. Using the SSA administrative data, we excluded individuals who received SSDI benefits as of the first SIPP wave from our analysis sample, tracked SSI receipt throughout the SIPP observation period (a more accurate approach than using the SIPP self-report data), and identified the earliest occurrence of a SSDI application up to six years after the first SIPP wave. The sample for this analysis was restricted to those between the ages of 25 and 55 whose first survey response occurred in wave 1. We excluded individuals younger than age 25 because they are less likely to qualify for SSDI and more likely to be enrolled in school. We excluded individuals older than 55 because we wanted to avoid tracking individuals who could qualify for early retirement benefits during our six-year observation period. We divided our analysis sample into the following groups of individuals considered to be at risk of applying for and receiving SSDI, and whom we term "at-risk group members:" unemployment benefit recipients with a disability, individuals with high health expenditures, workers' compensation beneficiaries, private disability insurance beneficiaries, veterans beneficiaries with a disability, and individuals with disabilities who have received job training or education services within the past year (see Table IV.1). We also included another group, workers with disabilities at risk of applying for unemployment benefits, whom we identified using a logistic regression model to predict the likelihood of unemployment benefit receipt; we selected individuals in the upper one-third of scores for this group. We examined various characteristics for each analytical group. These characteristics include demographic variables (age, gender, race, marital status, and educational attainment), as well as specific employment, income, and program-participation measures (as defined in Table IV.2). The analytical methods incorporated descriptive statistics, measured at a point in time or across six-month intervals, and comparative statistics (t-tests) to determine statistical significance. To improve the precision of our estimates, we show data only for statistics with at least 50 observations. Data are weighted using the SIPP panel wave 1 weights.